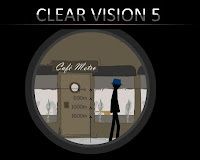 Clear Vision 5 is a point and click action shooter game from DPFlashes Studios in which you play the role of a sniper. Your mission, should you choose to accept it is to eliminate specific targets from afar. You are Tyler, an ordinary guy whose patience gets pushed too far and became a professional clean up guy. This however is also the beginning of social decline, false friends and a spiral deception so you better watch your back for you can't trust anyone. There are some tasks you need to accomplish in different missions and failure to comply with it will result in game over. The art style are as simple as before but the animation got more awesome since the 4.5 version of this game. Meanwhile, here is Clear Vision 5 walkthrough showing all missions accomplished. A fun sniping game where you go on missions to kill targets, get money, and upgrade equipment.